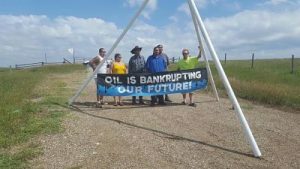 Amidst the cries of “protect our water, protect our land, protect our peoples,” Native Americans, ranchers and farmers are standing their ground along a highway in North Dakota. They are blocking the crews of Energy Transfer Partners — a Dallas-based company whose workers are protected by both police and armed, private security personnel — from accessing the site of the construction of the Dakota Access Pipeline. The roughly 1,200-mile-long pipeline would transfer about a half million barrels of oil a day from North Dakota to Illinois. Opponents of its construction worry that a leak or rupture would spell disaster for not only the Standing Rock Indian Reservation, but for all communities along the Missouri River that depend on it for drinking and agriculture. At least 10 arrests have been made. Morton County Sheriff Kyle Kirchmeier told the Bismarck Tribune that those arrested “were not staying within bounds set by law enforcement and getting in the way of surveyors working on the pipeline.” The arrests included a pediatrician and a grandmother who allegedly crossed the highway to check on a buffalo pasture. As reported by Truthout in May of this year, Lakota youth, protesting the proposed construction of the pipeline, began a relay race from their Spirit Camp in Cannonball, North Dakota, to the office of the Army Corps of Engineers in Omaha, Nebraska, to deliver a petition against the pipeline. The Corps later decided to grant the necessary permits and green light the pipeline’s construction. The runners decided to then continue their relay all the way to Washington, DC. As they did, the Standing Rock Sioux Tribe filed for both a permanent and preliminary injunction to block the pipeline’s construction. The case for the preliminary injunction, filed on August 4 to halt construction immediately, is set to be heard on August 24. 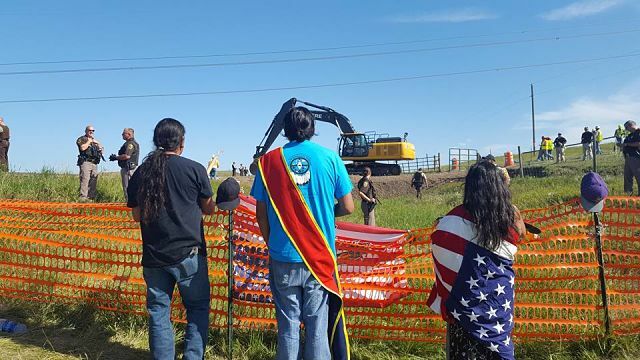 As the tribe prepared for the case, they were issued a 48-hour work notice that informed them construction was set to begin on the Dakota Access Pipeline on the morning of August 10. That’s when the “Camp of Sacred Stones” was set up in Cannonball, North Dakota, along the Missouri River. LaDonna Brave Bull Allard, the historic preservation officer for the Standing Rock Sioux Tribe, put the call out to land defenders to come to the camp to peacefully resist through prayer and solidarity. Brave Bull Allard explained to Truthout how the protesters turned the initial construction crews back. They returned soon after with more law enforcement personnel. “They blocked the crew’s access to the site with teepees and prayer circles. When the crew tried to access it through a different route they were blocked there as well. Police, highway patrol and sheriffs were all there,” she explained. Brave Bull Allard noted that the object of their protest is not the individuals building the pipeline, but the project itself, and the violations it represents. “Our goal is to not do any harm because the work crews are just people trying to make a living. Our job is to stand here in prayer,” she says. Stressing their nonviolent intentions, Waniya Locke, also of the Standing Rock Sioux Tribe, told Truthout how organizers checked protesters for weapons when arriving. “We are asking everybody to come stand with us in prayer. We are asking that people don’t bring weapons. We want nothing but prayer. We have a lot of people from everywhere here and we still need more,” Locke said. Moreover, she emphasized that the actions are meant to defend a broad range of people who have long depended on the river. In particular, Locke noted, the Dakota Access Pipeline plan violates the treaty rights of the Great Sioux Nation, of which the Standing Rock Sioux Tribe is a part. 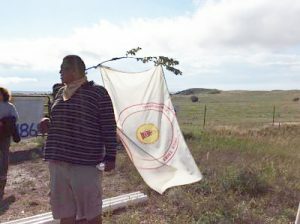 The Fort Laramie Treaty, signed on April 29, 1868, and bound by the US Constitution, guarantees the Great Sioux Nation absolute and undisturbed access of the Black Hills and lands spanning multiple US states, including the site of the pipeline construction on which they now make their stand. “They are violating not only my people of Standing Rock, but they are violating ranchers and farmers and everybody else who lives along this river,” Locke said. “We need people to stand up because that’s the only way the government is going to listen to us. That’s the only way they are going to revoke these permits,” Locke explained. The call to stop the pipeline is being heard far and wide. During a stop in New York City’s Union Square, the “People Over Pipelines” runners held a rally to educate people about the pipeline’s consequences. Documentary filmmaker Josh Fox (Gasland) and actresses Shailene Woodley and Rosario Dawson lent their support. Dawson, through a megaphone, issued a clear message for those who gathered to listen to the group of Lakota runners, some wrapped in their tribal flags. Woodley arrived at the construction site in North Dakota in time to watch some her good friends being carried away in handcuffs. These events only seeming to solidify her resolve. Locke, originally from Wakpala, South Dakota, grew up swimming and playing in the Missouri River and drinking its water. Her relationship to the river is as personal to her as it was for her ancestors who thrived along its banks. This article first appeared on truthout.org on August 13, 2016. © Truthout. Reprinted by permission.